I have never made pumpkin pie before...us Australians don't eat pumpkin pie. But I am now a convert...you guys in the U.S of A are sooo clever. 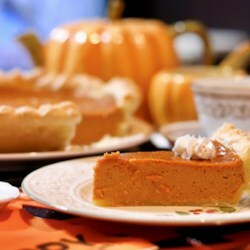 I want to make and eat pumpkin pie breakfast ...lunch...and dinner !!! I can't believe we don't make this over here...I am going to make it for Christmas Day again for all our visitors...if i can keep my husband and myself away from the pies for just long enough to let the visitors have a slice or 2 each. WAY BEYOND YUMMY ...HEAVENLY and DIVINE are words that come to mind. I wonder if i should go down the street and buy another butternut pumpkin and make one more before Christmas Day...they say practise makes perfect lol. We don't have tinned pumpkin or pumpkin spice over here so I have to do everything myself...but maybe that makes it even nicer.